We are keeping a close eye on BTC dominance because it can indicate the start of a new altcoin rally. Historical events show that every time BTC dominace is high altcoins go on a run resulting in new all time highs for the total marketcap. In this table you find BTC dominance VS the total marketcap. 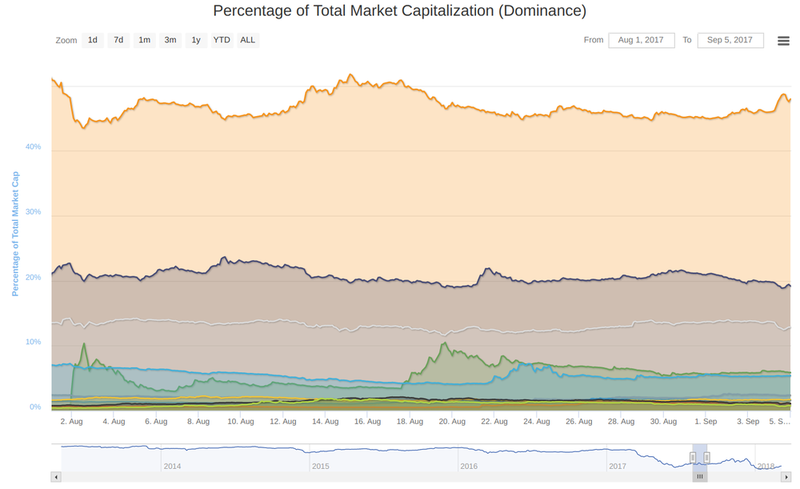 Everytime BTC dominance is high, altcoins go on a rally resulting in a higher total market cap. At the 1th of march 2017, Bitcoin reached a historical high dominance of 86%. Within 3 months BTC dominance tanked to 38%, the market cap gained 4,5 times, and the BTC soared over 200%. The high dominance of BTC resulted in attention for the total market, as well new investors. New investors always look for new opportunities so started to invest in promising projects. Notable is that Ethereum and ´other (all small alts together)' gained the most during this period. During this period BTC dominance did go from 51% to 45% while BTC price almost doubled. The same happened to the marketcap that did go from 92billion to 172 billion dollars. As we can see, BTC and altcoins dominance were almost the same in this period. This is easy to explain because cryptocurrencies received major attention during that period. At the 8th of December BTC dominance peaked at 66,5%, what was the start of the biggest bull run of 2017. In only 1 month, the market cap did go from 400 billion to 828 billion. BTC price also soared over that time, but the biggest winners were the altcoins.